Piezo amplifier, located in Marlboro, Massachusetts, has been chosen by NASA, Boeing LTS, Sandia, Argonne, Fermi Lab, MIT, Yale, Harvard, Corning: The PiezoMaster product line is a family of OEM Piezo amplifiers, that combine the amplifier with the power supply, to offer an extremely low cost piezoelectric actuator controller. Viking Industrial Products has been a leader in power management for over 40 years. Our expertise is analog high voltage, 0-5 amps, Dc-1 Mhz, 0-1200 volts, +/-800 volts. Design, test, manufacture, service of standard and custom OEM products for our customers. Contract manufacturing services are available as well. PLEASE CALL 1-508-481-4600 ext 14 or Email sales@piezomaster.com with your questions, we can help you order the correct model! The PiezoMaster is low enough in cost ($380.00 units 1-9) to be used either in open loop driver applications, or closed loop proportional control applications. The efficient design of the PiezoMaster series (7206 and 7210) provides a unique small package, that can be board or chassis mounted. The PiezoMaster can be located close to the actuator. 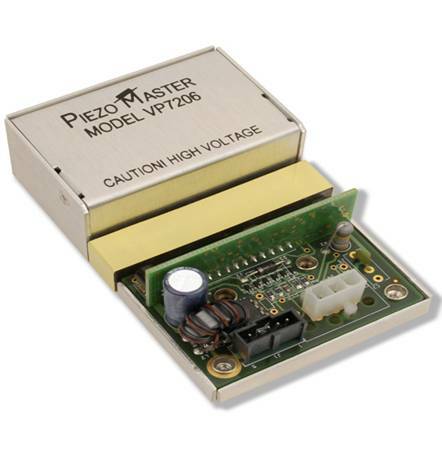 The PiezoMaster amplifiers have the high peak power to control actuators of many sizes, and there are options available to match specific system requirements. The strength of the PiezoMaster is its ability to be customized to bring a simple, effective and economical solution to controlling piezoelectric actuators. Viking now offers a low noise, bipolar Model VP7210 and high frequency/high power drivers (DC-1 Mhz, 1-4 amps) and amplifiers.We have many customers that are using our amps for Interferometry, laser tuning, mirror positioning, de-icing of aircraft and flow control, spectroscopy, cytometry. Please do not hesitate to inquire regarding your special application. All questions are welcomed and kept confidential.